WIESBADEN, Germany -- Russia is working to develop within a few years the capability to threaten several neighbors at once on the scale of its present operation in Ukraine, a senior American general said. 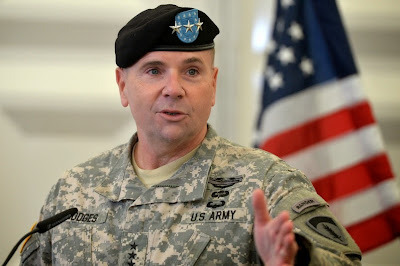 U.S. Army Europe commander Lt. Gen. Frederick 'Ben' Hodges. Lieutenant-General Ben Hodges, commander of U.S. Army forces in Europe, told reporters an attack on another neighbor does not seem like an immediate threat because Moscow appears to have its hands full in Ukraine for now. Moscow denies its active troops have fought in eastern Ukraine, but Western governments say they have evidence it has sent armored columns and hundreds of soldiers. Almost 5,000 people have died in the conflict, including nearly 300 on board a Malaysian airliner shot down over rebel-held territory. NATO experts say the Ukraine conflict, in which Russian forces swiftly annexed the Crimea region and pro-Russian rebels scored rapid gains in the east, shows Putin's increased spending has already yielded results. Russian forces, particularly small elite units, have proven far more effective than in a 2008 war in Georgia, they say. Plans for this year would include 700 new armored vehicles, 126 new military planes, 88 new helicopters and two brigades of Iskander-M air defense systems, he said. Even so, Moscow's defense budget of about $68 billion in 2013 was only about one-ninth of Washington's, according to the International Institute for Strategic Studies think tank. The West must be very careful neither to over-estimate Russian strength nor to become complaisant. Whenever confronted by determined opponents, Russia lost. They lost to the Japanese in the early part of the 20th century. Then to the German/Austrian forces in World War I. Then to the Finns in 1939. Then - almost certainly - would have lost to the Germans if the Germans had not taken on much of the rest of the world at the same time, and if not for American land-lease. Then it took them two wars to subdue tiny Chechnya. They did not cover themselves with glory even against 5 million Georgians. In short, Russian military prowess, leadership, logistical capabilities have always been inflated to gain whatever advantage they could through bluff and intimidation. There is a great deal of rot under that seeming colossus. Like bullies anywhere, Russians generally go after pint-sized opponents and often can't even succeed against them. The simple best description is that - in their stance against the outside world - they are predatory bottom feeders......a very, very far cry from the deranged Alexander Dugin's description of them as the "supreme society". It is only a matter of time before they lose Siberia to the Chinese. But complacency would be one of the worst reactions to over-exaggeration. In as much as they are always looking for weakness and for weaker opponents, they are much more likely to confront a country that has failed to keep up its guard and military strength than one that has. They may be delusional and they may be posers but they are not stupid. So NATO countries would be well advised to brush the cobwebs off their tanks; get their troops in shape; put some earplugs into their ears so as not to have to listen to Lavrov's dire warnings that "Russia will respond in kind" (they would if they could) and face Russia.............. calmly. Very good advise. Thanks George.